a high degree of uniformity of soil type. The irrigation of a poor soil may be economical in the short run but can be uneconomical in the long run. Such soils can lower long run profits in a number of ways such as reducing maximum yield, requiring expensive remedial treatments (eg gypsum application, deep ripping, drainage) and resowing after surface crusting has caused emergence failure. The more uniform the soil, the easier it is to manage. If it is necessary to cut and fill, the soil should be examined to the depth of the maximum cut to judge the likely effect on production. Infiltration means the process of water entry into the soil and adequate infiltration is vital for successful irrigation. It is determined by soil type and texture. Sandy soils have the highest infiltration quality. Some clay soils such as black basalts, have a high short run rate of infiltration because of cracking but this attribute disappears during cooler and wetter weather. Although the topsoil is of major importance in determining the infiltration rate, the nature of the subsoil is also important. Adequate drainage under irrigation is essential. It is achieved by careful planning and consideration of the surface drainage in the land preparation and by choosing a soil with good internal drainage. Experience gained on older developed irrigation areas clearly indicate that subsoil drainage ultimately becomes necessary. Therefore, irrigation land should be of soil types known to respond to subsoil drainage with contours enabling the provision of mains and outfalls for the disposal of both subsoil and surface drainage waters. It is common for the irrigator to experiment with watering systems particularly on different soil types. Therefore, the valuer on inspection, should not accept that all the land being irrigated is suitable for irrigation. He/she should seek the expert advice from soil conservation, irrigation and water authorities and use soil maps when determining the area of a farm suitable for irrigation. The aim of irrigation, whether flood, drip or spray is to supply sufficient water to the soil so as to provide an optimum amount of moisture within the soil at the plant's roots. The most obvious benefit is the increase in crop yield but to achieve this on a more less continuous basis requires a highly skilled level of management. All soils were not designed by nature to cope with a continuous supply of moisture. Otherwise irrigation soils would have the spongy nature of many tropical and subtropical soils which regularly have to cope with copious rain. If the farmer imposes a new moisture regime on many soils he/she needs to have a good knowledge of what will happen to the moisture in the soil in the long run. The most important part in analyzing a sale of irrigated land is to determine the added value caused by the availability of water to the property through irrigation. Generally, in irrigation areas (such as the Murrumbidgee Irrigation Area) there are a large number of irrigated farms and the area is comparatively, densely settled. A lower risk to the expected future income and benefits occasioned by irrigation. That is, comparatively immune from the effects of drought. The ability to utilize an intensive land use on an irrigated farm which would have been impossible on a "dry" farm. For example, vineyards. the viability of the irrigated land use in the district. this will often be subject to fluctuations in demand from overseas markets. the response of soils to long term watering for example, salt and pan problems may result. the simultaneous provision of channels and drains as distinct from channels only. the extent, frequency and degree of the supply of water. can the allowable quota be transferred to other parts of the property if required? A large tract of land subject to irrigation for the first time will not command as high a price as land in an established irrigation area. First time irrigated or newly occupied irrigated areas (a “pioneer” land use) are deemed risky by the general market whereas established districts are "proven" or "safe". Further, whether or not there may be degradation through a higher water table is not yet known. The first 10 years of a new irrigation district are critical in proving the viability of irrigation compared to adjacent dryland farming. The loss of moisture by evaporation and extraction is called evapotranspiration. Upon the completion of an irrigation application there is an appreciable amount of water on the foliage that evaporates into the air. The saturated surface of the soil evaporates at much the same rate as does a free water surface. After that, the moisture loss from the soil is by way of plant extraction. Crop factors are a general measure of the behaviour of different types of plants in this regard when compared to the evaporation from free water surface. Drip irrigation is the superior method in this regard having the lowest rate of evapotranspiration. Therefore, 12cm is the amount of moisture which must be incorporated into the root zone of the crop to achieve optimum growth, either by rainfall or irrigation or a combination of both. Because some of the water applied, particularly by spray irrigation, will evaporate before it can enter the soil, it is necessary to apply an additional amount to compensate for this loss. When climatic conditions of high temperature, low humidity and strong winds occur, the calculated amount should be increased by 20%. For conditions of low temperature, high humidity and light winds the calculated amount can be increased by 10%. Suitable topography is necessary for good drainage. Some land may be above the head of water and therefore, cannot be irrigated without pumping and storage. Therefore, the valuer has to ascertain not only the area of land allowable to be irrigated under the water licence but also whether or not it is suitable for irrigation. An irrigation farm with poor drainage will lose value over time through increased salinity & a rising water table. Working costs are higher on irrigation farms compared to equivalent dry farms because of the problems of access, moving equipment and manpower over the property. That is, good access to all irrigated parts of the farm is critical. The nature of the land after clearing. For example, is it rough, undulating, or level? The type of irrigation proposed. Gravity irrigation systems are levelled with a gradient of between 1:500 to 1:2000. The steeper grade is used for quick watering (for example, on pastures) and the lower grade for systems requiring good drainage but deeper and longer water penetration (for example, row cropping). The degree of development is similar to the preparation of dryland for cultivation although the clearing is more radical (eg no shade timber). Further, the ground is ripped deeper but otherwise the marginal cost of land prepared for irrigation is small. All work is quoted on the basis of the amount of soil to be removed. To prepare a perfectly level site of 0.4 ha which is required to have about 20 cm fall in 200 metres (ie 1:1000) requires the movement of about 103 cubic metres. Adjoining dryland complements the primary land use of the irrigated lands. Therefore, the adjoining dryland has more value than if it was used as dryland alone. This is an important principle in rural valuation and applies to other inferior adjoining lands. For example, adjoining "rough" land used as "relief grazing" and lambing paddocks complements good grazing and arable lands. Overhead sprinklers and furrow irrigation are being steadily replaced by undertree or undervine systems which use much less water. 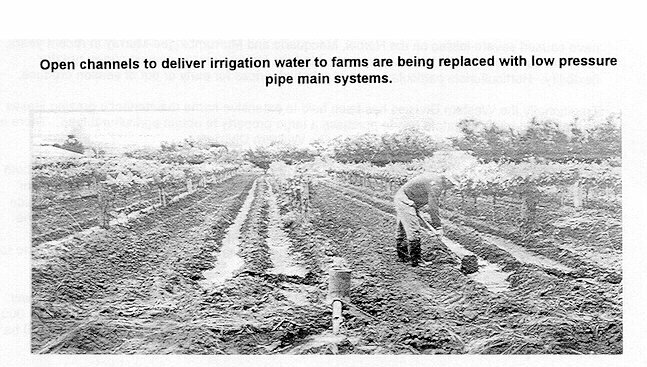 Open channels to deliver irrigation water to farms are being replaced with low pressure pipe main systems. There are very few private schemes in Australia and only one large private scheme in Victoria. In this case, a company of adjoining landowners was formed to divert water from a storage reservoir by pumping into a large distribution channel passing through neighbouring properties to the point of delivery. Such schemes are generally, uneconomical and create a number of legal problems in relation to ownership and maintenance. In NSW an example of a private scheme is the Moira Irrigation Scheme situated between Deniliquin (NSW) and Echuca (Victoria). It covers about 60 farms over about 10 000 ha. Irrigation in the Western Division of NSW is carried out at Bourke, Menindee and the lower Murray-Darling near Wentworth, Euabalong and Hillston. Smaller irrigation areas exist on the Barwon and mid Darling rivers and on smaller streams such as the Narran, the Culgoa system, the Warrego and the Bogan rivers. Although the western division is predominantly a pastoral area there is a trend towards irrigated cash crops such as sorghum, oilseeds and cereals. Annual crop and pasture irrigation fluctuated during the early and mid 20th century with modern large scale irrigation becoming established over the last decade or so. During and immediately following severe drought in the mid 1960s irrigation blocks usually of about 160 ha were developed on some grazing properties with frontage to permanent rivers. Inexperience with irrigation, cost increases and poor prices for livestock have either closed many of these blocks or forced a change to cash cropping. In the mid 1970s experienced farmers from beyond the Western Division conducted successful cash cropping irrigation enterprises. Broadacre irrigation is largely concentrated at Bourke, Menindee, the lower Murray-Darling near Wentworth, Euabalong and Hillston. Lesser areas are found on the Barwon and mid Darling and on the smaller streams such as the Barran, the Culgoa system, Warrego and Bogan. Isolated small plots generally up to 20 ha are found around bores or ground tanks. Horticultural production, chiefly of citrus, vines for various purposes and vegetables has enjoyed a more stable and successful history. The lower Murray-Darling development was initiated by the Chaffey Brothers in the 1890s. Smaller horticultural areas are found at Menindee, Bourke and Hillston. Isolation and aridity offer the irrigator both advantages and disadvantages compared with the more traditional irrigation areas. Being arid, water requirements are more important and and frequent. However, irrigation allows greater control over the farm environment and therefore reduces risk. Irrigation has reduced the frequency of floods and cultural and harvesting operations are less likely to be impeded by rainfall. Isolation provides a buffer against a number of diseases and pests (eg for pure seed production). However, freight costs are higher and the services of both the government and agribusiness are more difficult to obtain. Only the Murray and the Darling downstream of Menindee lakes have assured water. Elsewhere irrigators do not have the advantage of headworks to ensure water availability and therefore, large scale irrigation has concentrated in safer areas. However, lower reliability is compensated by less risk of heavy rain, floods or mouse plagues that have caused severe losses on the Namoi, Macquarie and Murrumbidgee-Murray areas in recent years. Long hot summers results in high evaporation but the longer growing season allows greater flexibility. Horticulturists particularly, can obtain high prices for early or out of season produce. Traditionally the Western Division has been held in extensive home maintenance grazing leases so that prospective irrigators have had to purchase a large property to obtain agricultural land. There is very little suitable freehold land available in the Western Division. At Bourke cotton is a cash crop of great importance. Irrigated grain production of both summer coarse grains and winter cereals are also important. However, the need for cartage of over 200 km to the Grain Handling Authority (GHA) at Nyngan detracts from profitability. A wide range of vegetables have been grown by market gardeners and broadacre farmers for both the fresh market and processing. Bourke has great potential for high quality processed potatoes. There is little pasture and forage production being mainly, sorghum, cereals and lucerne for hay. Irrigated wheat is a major crop at Euabalong with smaller areas of sunflower and grain sorghum. The total area fluctuates around 1 500 ha. The Hillston area has some 4 000 ha of irrigation including about 500 ha using bore water. Most land is under pasture but 1 200 ha of cash crops are grown, 1 000 of which is sorghum. Small irrigation farms and market gardens have been a feature of Menindee for many years supplying both Broken Hill and capital city markets. The total area is about 140 ha, half of which was planted to various tree and vine fruits. New large scale flood irrigation currently using 4 000 ha is laid out on the bed of Lake Tandou southwest of Menindee where winter cereals, coarse grains and oilseeds are grown. The concept of irrigation on lake beds or alternatively sowing crops into mud left by receding lakes is creating more interest in the mid and lower Darling. The most important Western Division irrigation area is the lower Murray-Darling with about 15 500 ha in the shires of Wentworth and Balranald. This exceeds the total of the remainder of the Western Division. Fruit, vines and vegetables use about half of the irrigated area. Grape vines occupy about 2/3 of this and citrus makes up most of the remainder. There are interesting and promising developments in avocadoes, normally only grown in the tropical coastal climates. Horticultural produce is sold mainly in Melbourne and to a lesser extent Adelaide markets. Spray irrigation is used for most of the lower Murray-Darling for fruit and vegetables. 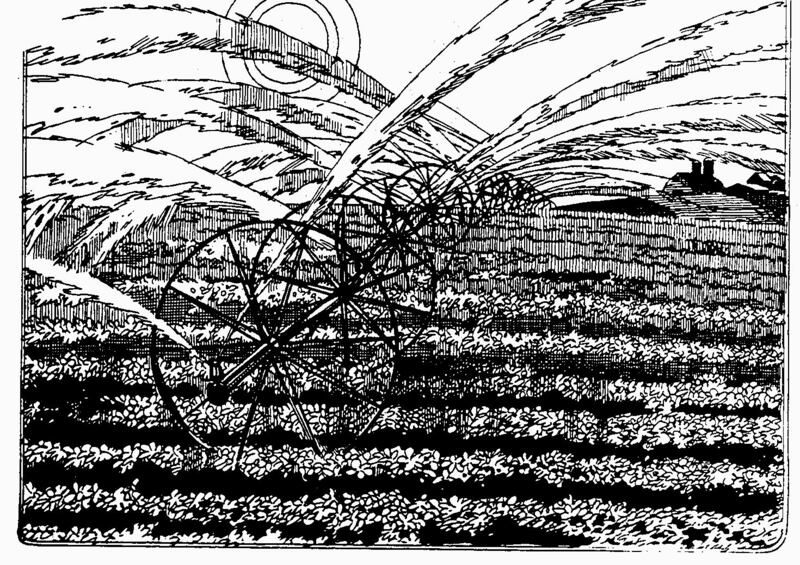 Furrow irrigation predominates on all other Western Division irrigation farms. The remaining lower Murray-Darling irrigation is devoted to winter cereals and pasture and only small areas of summer crops. The irregular nature of most Australian waterways has prevented the development of large private irrigation schemes which are found in the USA and nearly all irrigation uses water supplied by government authorities. Distribution in most cases is by way of open channels carrying the water at a level to irrigate by gravity. These channels are supplied from the streams by diversion weirs to raise stream level for example, the Goulburn Weir, Yarrawonga and Torrunbarry Weirs on the Murray. Wherever land is irrigated, it is usually necessary to dispose of surplus water. In the early years of the highlift irrigation areas, seepage shafts or deep bores were used. The lessee would install a system of tile drains through the area of his holdings affected by seepage and these drains would enable the surplus water to gravitate to the shafts and bores. This method of disposal of drainage water was successful for a while but had limitations which necessitated the provision of comprehensive drainage schemes. A typical drainage scheme consists of a system of main drains which collect water from the lessee's tile drains and transport it to receiving structures known as drainage caissons. From these the water is pumped to evaporation basins on the river flats. They are periodically flushed out in times of high river flow. Salinity levels in the Murray have been increasing in recent years. One of the major reasons for this is that surplus irrigation water raises the level (water table) of the naturally highly saline ground water thus increasing it flow into the river. High salinity levels (above 850 EC (electrical conductivity) units) will damage a number of irrigation crops and over a long period, trees and vines will die through saline toxicity. The use of undertree irrigation systems lessens the effect of salinity on plantings but the problem of surplus water disposal exists. The Engineering and Water Supply Department (EWS) of South Australia in association with the Commonwealth has funded research into ways of combating these problems.